Ask the StoryBots is an American animated children's television series based on the characters from the StoryBots educational website and videos. It was created and produced by JibJab Bros. Studios and premiered exclusively on Netflix on August 12, 2016. In its first season, the series was nominated for an Annie Awards, was a finalist for a Peabody Award, was nominated in the International category at the British Academy Children's Awards and received six nominations for the Daytime Emmy Awards, including Outstanding Preschool Children's Animated Program. It won the 2017 Daytime Emmy Award for Outstanding Interactive Media - Enhancement to a Daytime Program or Series. Its second season, which premiered on Netflix on August 24, 2018, received the Annie Award for Best Animated Television Production for Preschool Children and has been nominated for an additional five Daytime Emmy Awards. 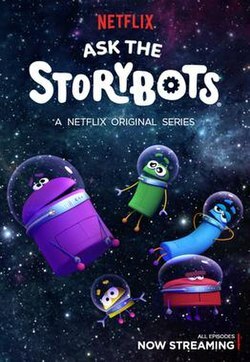 Ask the StoryBots also inspired a holiday special, A StoryBots Christmas, also on Netflix, which won two Daytime Emmy Awards. The StoryBots are curious little creatures who live in the world beneath our screens. In each episode, the intrepid quintet of Beep, Bing, Bang, Boop and Bo of Team 341B go on an adventure to the human world to help answer kids’ biggest questions, like “Why is the sky blue?” or “Why do I need to brush my teeth?” They deliver their answer at the end of each episode in the form of a musical video. Ask the StoryBots made its first-season debut with six half-hour episodes. Its second season premiered August 24, 2018 and includes eight half-hour episodes. "Why Do I Have To Brush My Teeth?" "Where Do French Fries Come From?" "Why Can't I Eat Dessert All the Time?" "How Many Types of Animals Are There?" "How Do People Catch A Cold?" Ask the StoryBots received positive reviews, with critics specifically citing its educational quality and its entertainment value for both children and adults. Common Sense Media wrote that “[It’s] both educational and entertaining in every scene yet is visually appealing as well as humorous enough to make both children and parents laugh out loud... While the premise of the show is to answer a child's question, the antics that the characters get themselves into are very funny, and each episode always has an educational twist without being obvious... [T]he magazine format of the show allows for things such as music videos, letter rhyming, songs, and field trips to different places." The Domestic Geek called the show "a really fun and great way for your the family to learn and laugh together," while Chico News & Review wrote that "parents and children alike will want to binge on Netflix’s new edutainment series, Ask the StoryBots... The StoryBots dive deep into the natural world, research well-rounded answers and report back through contemporary music, humor and repetition." The show's first season soundtrack, Ask the StoryBots: Season 1 (Music from the Original Series), was released to digital vendors in September 2016 and is currently available for download and streaming on Spotify, Apple Music, ITunes and Amazon.com. The series' second season soundtrack was released on August 31, 2018. A companion series, StoryBots Super Songs, premiered on October 7, 2016, also on Netflix. A holiday special, A StoryBots Christmas, premiered on December 1, 2017, and features Ed Asner in a guest appearance as Santa Claus. It received two Daytime Emmy Awards, including Outstanding Special Class Animated Program, with an additional four nominations. ^ Barrett, Brian. "Parents, Rejoice! Here Are Netflix's Kid-Friendly August Additions". Wired. Retrieved 2 August 2016. ^ "Announcing 76th Annual Peabody Awards Finalists". Retrieved 2017-04-14. ^ "Nominations Announced for the British Academy Children's Awards in 2017". www.bafta.org. Retrieved 2017-10-24. ^ "THE NATIONAL ACADEMY OF TELEVISION ARTS & SCIENCES ANNOUNCES NOMINATIONS FOR THE 44th ANNUAL DAYTIME EMMY® AWARDS | The Emmy Awards - The National Academy of Television Arts & Sciences". emmyonline.com. Retrieved 2017-03-22. ^ Andreeva, Nellie; Andreeva, Nellie (2017-04-29). "Amazon & Netflix Lead Daytime Creative Arts Emmy Awards Winners- Full List". Deadline. Retrieved 2017-04-30. ^ "The 46th Annual Daytime Emmy Award Nominees – The Emmys". emmyonline.tv. Retrieved 2019-03-20. ^ "Netflix Announces 'Ask the Storybots,' An Original Series from Jibjab". 2016-08-05. Retrieved 2016-08-12. ^ "Ed Norton, Snoop Dogg, Ali Wong to Guest on Netflix's 'Ask the Storybots'". TheWrap. 2018-08-14. Retrieved 2018-08-14. ^ "They're Back! All-New StoryBots TV Series Premieres Today". StoryBots Blog. 2016-10-07. Retrieved 2016-10-18. ^ "Ask the Storybots - TV Review". Retrieved 2016-10-18. ^ "Ask the Story Bots: Entertaining for kids...and twenty-somethings - The Domestic Geek Blog". The Domestic Geek Blog. 2016-09-09. Retrieved 2016-10-18. ^ "Netflix/JibJab - Ask the StoryBots - In the Mix - Special - Arts&Culture - September 22, 2016". Chico News & Review. Retrieved 2016-10-18. ^ "Ask the StoryBots: Season 1 Soundtrack Now Available!". StoryBots Blog. 2016-09-09. Retrieved 2016-10-18.